There's something serene yet stunning about blue. It comes in a multitude of shades — from robin's egg and cerulean to cobalt and navy — and it's super versatile. 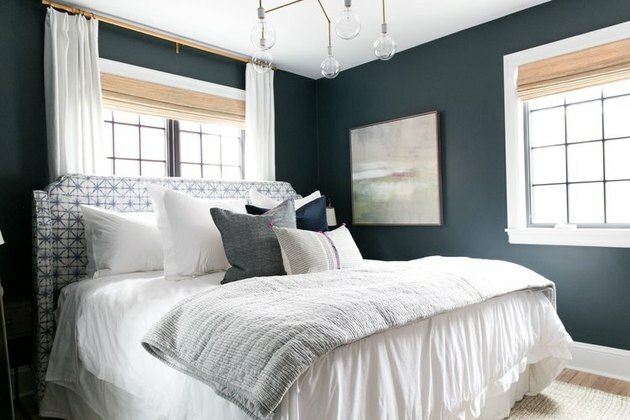 No wonder it's such a popular pick when it comes to wall color. We love it in hallways and kitchens alike, but one of our favorite spots to show off this dreamy hue is in the bedroom. 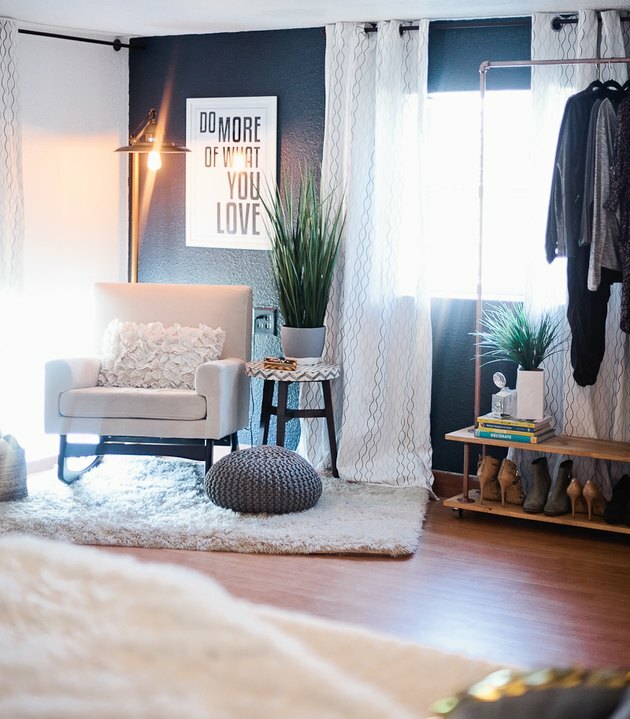 Thinking about giving your boudoir a refresh? Take a peek at these 13 brilliant blue sleeping quarters. 1. Paint the walls and the ceiling. The brainchild of Marie Flanigan Interiors, this Galveston bungalow comes to life with a striking palette. Bold indigo extends from the walls to the ceiling, offset by crisp white trim. Incorporating light wood and coastal accents also contributes to the overall aesthetic. 2. You can't go wrong with coastal chic. 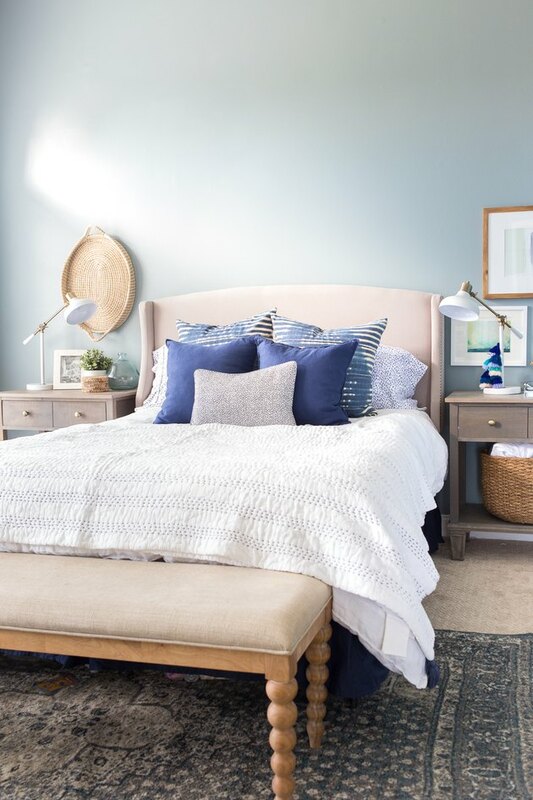 This bedroom redux by Chelsea from Making Home Base conjures ocean breezes and soft sand. Sky blue sets the tone for tranquility, while seagrass baskets and abstract artwork enhance the beachy, boho vibe. 3. Infuse a little Hollywood glamour. 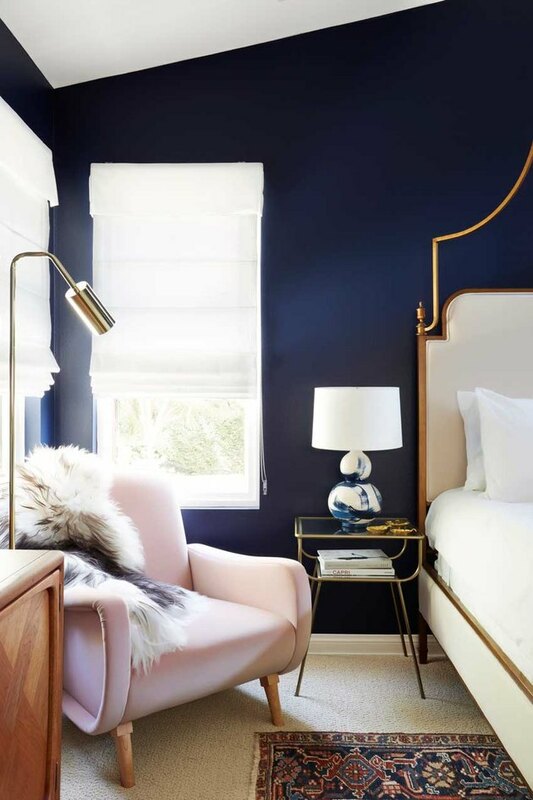 Thanks to Murphy Design, rich navy walls paired with sumptuous textures and refined furnishings make for a regal yet relaxed space to snooze. It's stately without an ounce of stuffiness. 4. Embrace your inner bohemian. Bright and airy: The color scheme in blogger Megan Ellaby's abode is a breath of fresh of air. A coordinating quilt and an ornate mirror impart a lovely femininity, while music related prints and posters add a hint of rock 'n' roll. 5. Opt for a shade of blue-green. This master bedroom designed by Studio McGee is sophisticated and serene. It all starts with deep, blue-green walls complemented by a brass chandelier that infuses luxury. 6. Give your walls a matte finish. 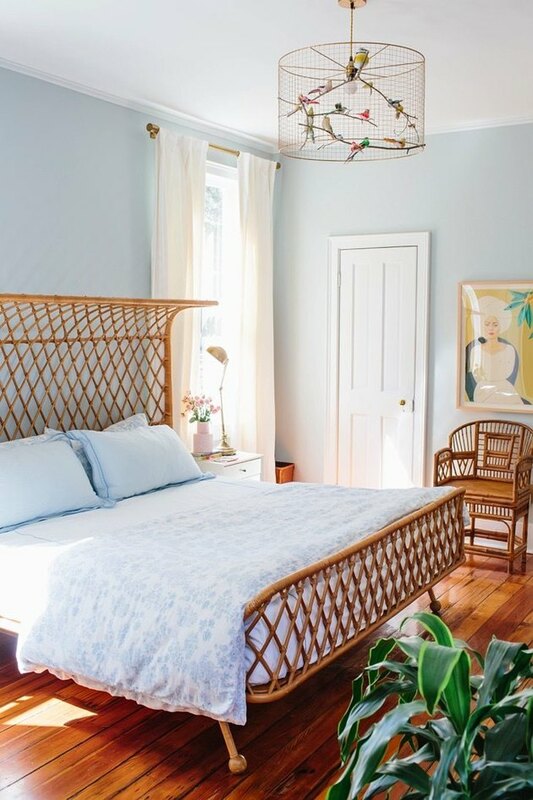 This sun-drenched guest bedroom belonging to The Nesting Game blogger Molly, takes a moody approach to design using rich, soothing tones. A matte navy backdrop really brings out all of the beautiful colors in the area rug, giving it the perfect opportunity to shine. 7. Stop just short of the ceiling with a tall wainscot. 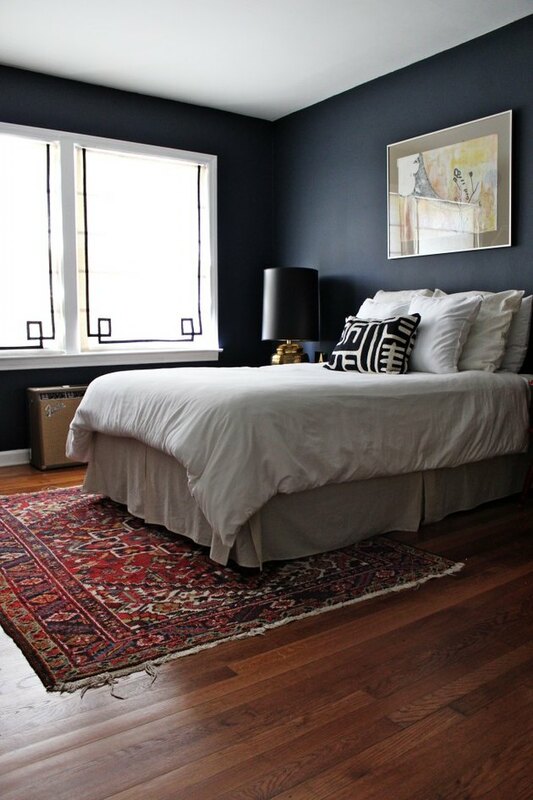 Mysterious and alluring with a major dose of modernity is the best way to describe stylist Tiffany Wendell's bedroom. 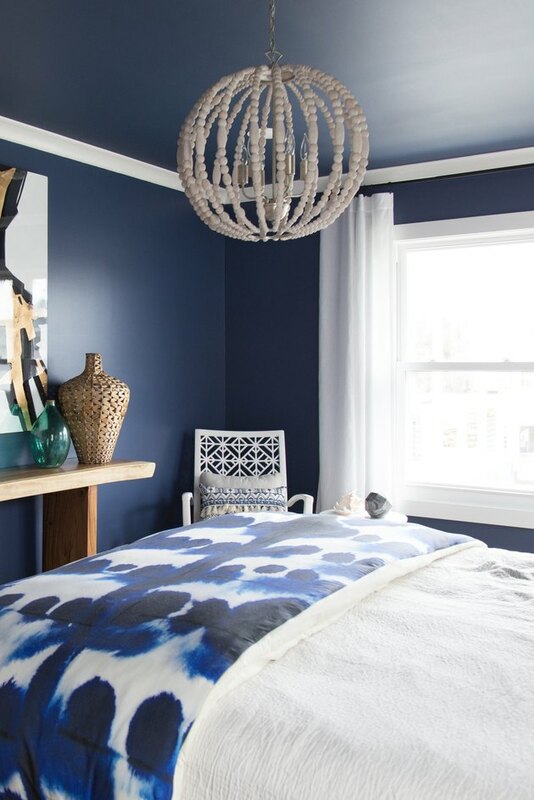 Navy walls are complemented by clean lines and a soft bohemian accents. 8. Consider an accent wall. Not yet ready to commit to a full-scale paint job? 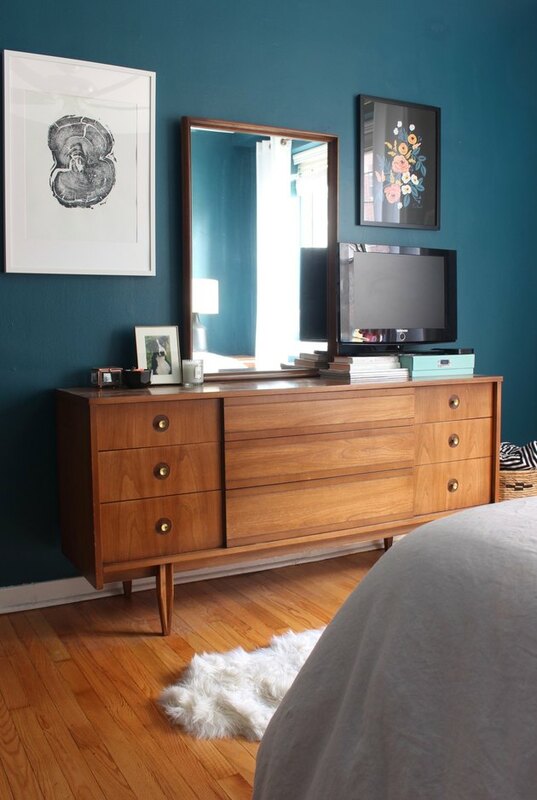 Consider an accent wall like Tabitha from Fresh Mommy Blog did in her master bedroom. A strategic splash of color can make a major impact. And this room is a perfect example. 9. Transform your bedroom into a dreamy respite. 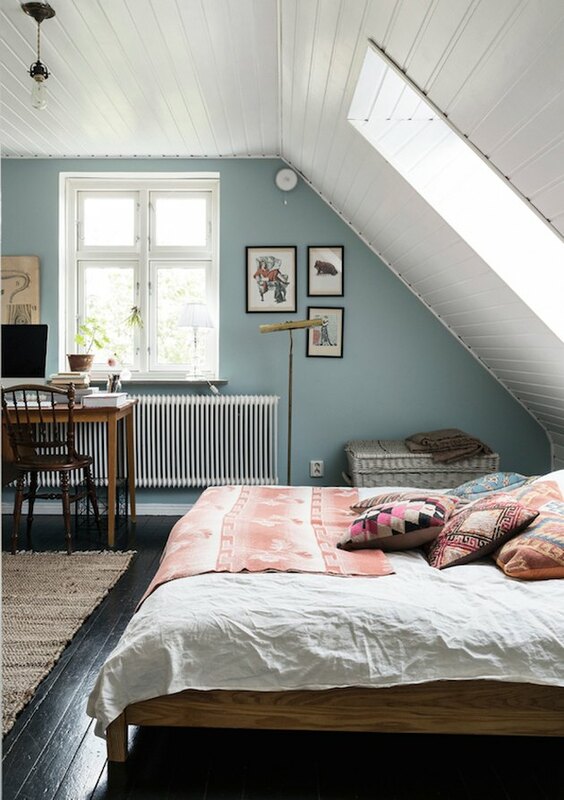 Inspired by the sea at Lulworth Cove, En Klick Smör blogger Anja's bedroom is clad in a mid-blue shade. The color exudes a peaceful feel, especially when paired with white and gray hues throughout. Woodwork, textiles, and art inject oodles of charm. 10. Don't run away from saturation. 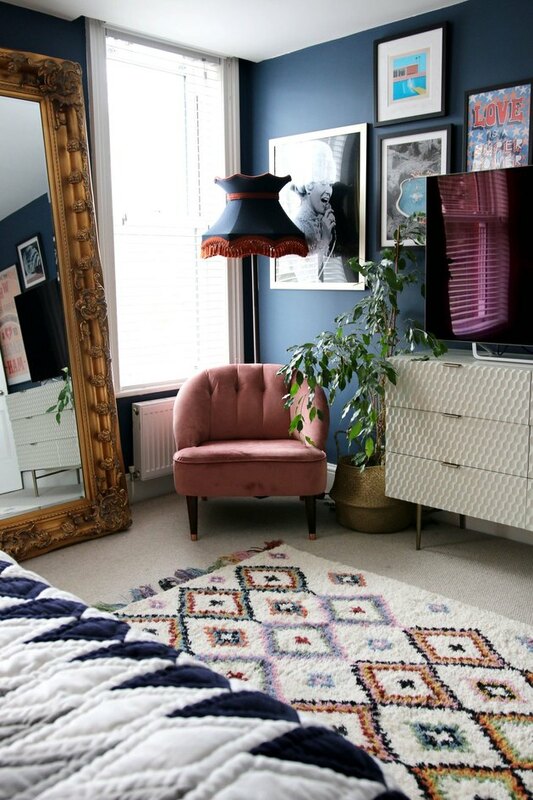 Unique, dynamic, intriguing — from Design Evolving blogger Mara's bedroom is a vibrant dream. The walls are cloaked in a saturated blue-green hue that certainly lives up to its name. And novel objects, such as a midcentury dresser, colorful books, and interesting art prints add depth and dimension. 11. Imbue calm with a barely there shade of blue. 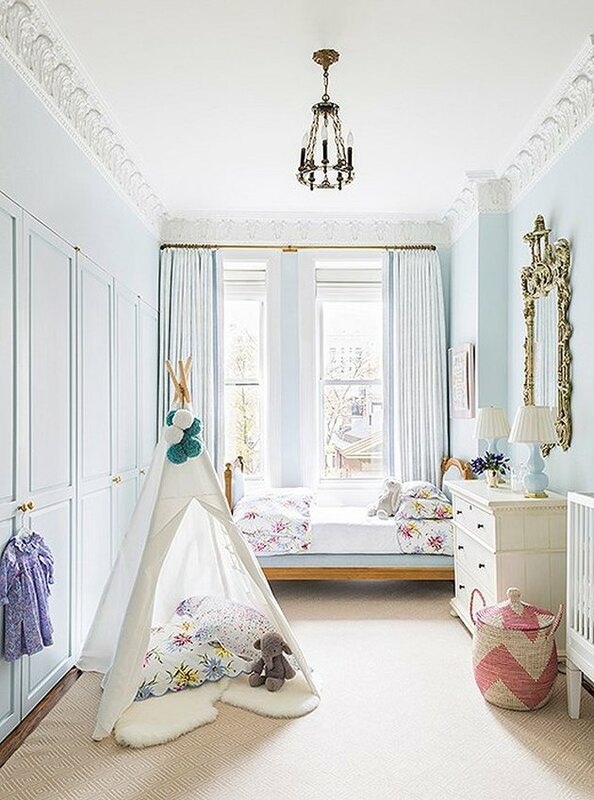 The energy in interior designer Cece Barfield Thompson's girls' room is playful yet calming. Despite the bright palette, this is still a place that encourages sweet dreams. 12. Use accents to keep things light. 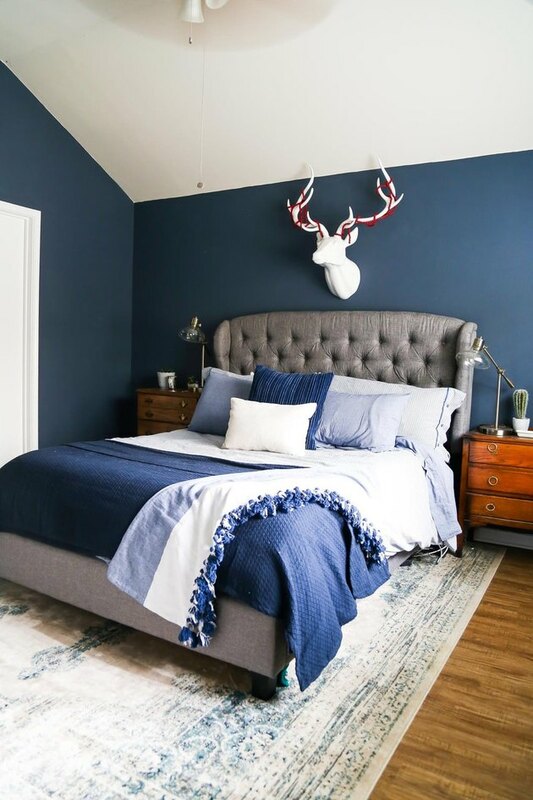 Amanda from Love & Renovations used dark paint and masculine elements — like a faux stag head — to create a warm ambiance in her master bedroom, while the multicolor area rug and bed linens invite some levity, keeping it from reading too heavy. 13. Warm things up with wood accents. Craving a space that's cozy and comfortable? 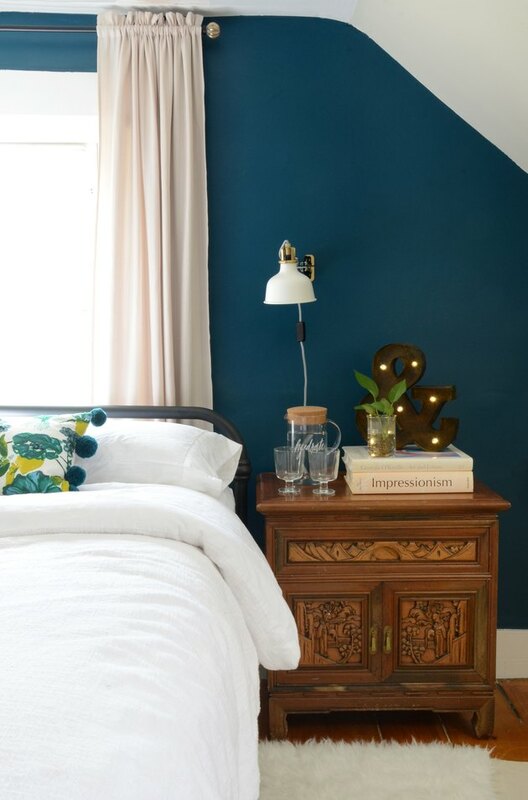 Consider moody hues à la this lovely guest room designed by Faith over at Design Fixation. Playful touches — like a glass water carafe and amenity box — invite overnight visitors to feel right at home.